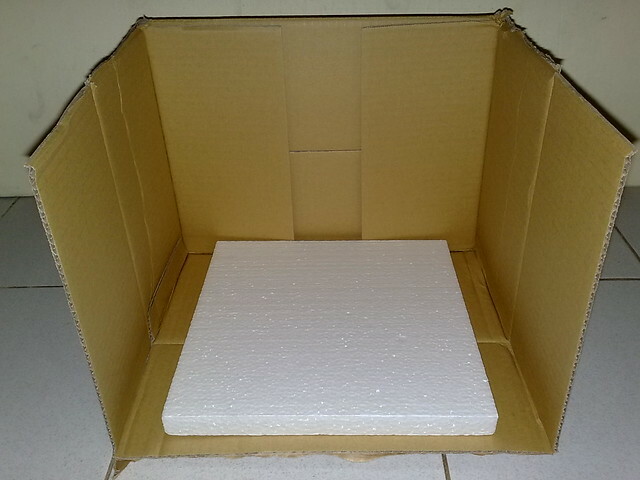 Will be spray painting my 1/72 VF-25G soon, so the first thing I wanted to do was to build my own Spraying Booth. This one I wanted to make portable so that I could bring it outside when painting yet store it inside the house. 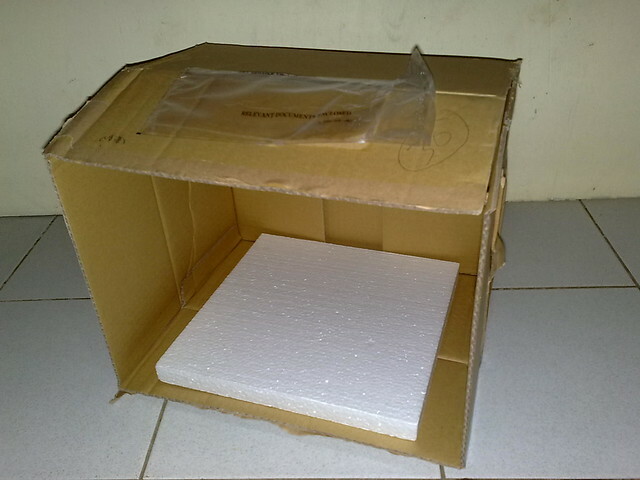 The materials and tools I got for this little project was an old box that Over-Drive-Inc had used to ship my VF-1S over. This box opened up from the top. 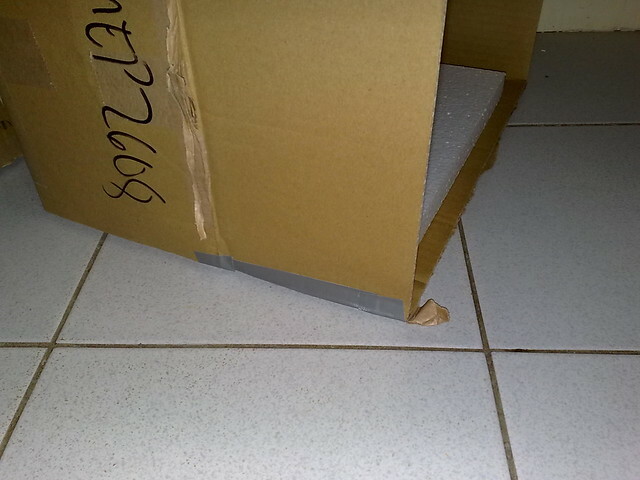 Then I got some duct tape, a Styrofoam board and a pair of scissors. I first let the box lie on its longest side. The 3 flaps of the cover of the box adjacent to the bottom side flap I tape together. Then I cut out the other side opposite of the one that is lying down till the base of the box. The top side I flip over to the back of the box, I refer to this as the "open" position. Below is the finished product. Here's a shot of the duct taped sides. I prefer to use duct tape for its sturdiness and industrial strength. This is a shot of the spray booth in the top down position. The Styrofoam board will be used as the base where you can stick in the sticks. The sticks is where the model parts will be taped to so that they are suspended when spray painting allowing for better coverage. The thing to keep note of is that you have to make sure that the paint doesn't hit the Styrofoam during spraying if it is the type of paint that attacks Styrofoam. One way to avoid this is to use longer sticks. 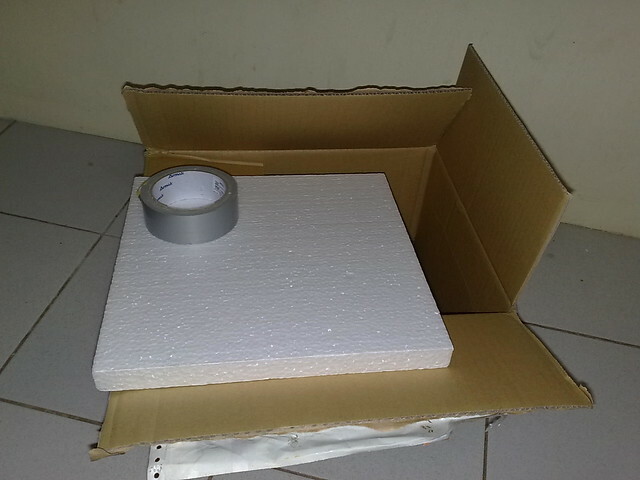 Also be sure that the Styrofoam board is both wide and thick and enough that the weight of the model parts won't allow it to topple over. Do test sticking the stick with the part in the styro first prior to painting. The last time I spray painted a model kit, I was still in high school. And I didn't use a spray painting booth, but rather just put it on old newspapers. Having been exposed to how the professionals do it, I realized that there really is a benefit to having a spraying booth.